This is part of the history of a large estate in Stoke Newington which was accumulated over the years and sold in 1891 when the owner died. What had been a large private estate became rows of Victorian villas. It illustrates a great change which came over Stoke Newington in the last third of the nineteenth century. Click on the picture to read about the the years from 1810 to the death of Mr Alexander in 1891. The 1846 Tithe Map shows ‘The Willows’ as a large house in Stoke Newington Church Street, by Paradise Bridge which ran over the New River. 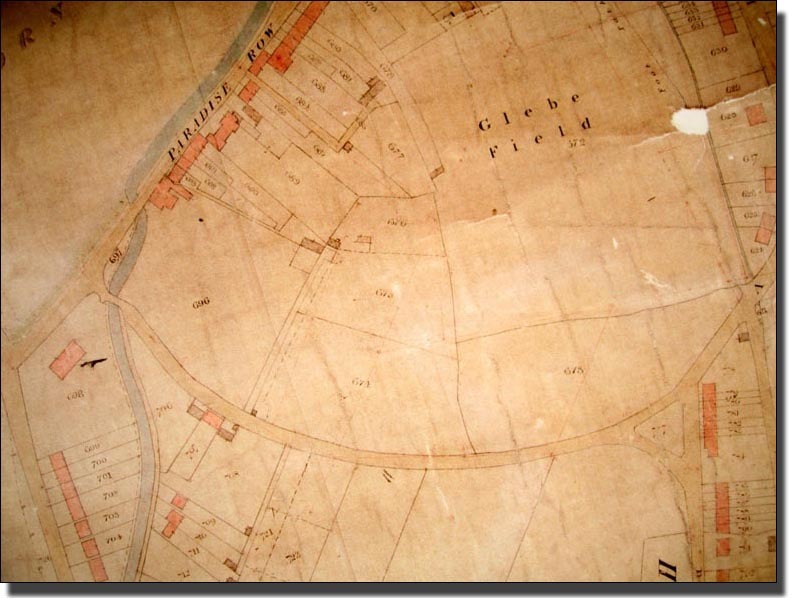 To the rear were almost empty fields along Park Lane, which we now know as Clissold Crescent. Over the years a few houses were built and, when the owner, Mr. Alexander, died the sale document was impressive. It describes a ten ace site and each the various houses in detail and, at the end is this coloured plan. (Click on Map to see an enlarge version of the map. This Sale Plan of the huge estate which ran the full length of Clissold Crescent, is almost as bright today as it was at the time of the sale, over a hundred years ago. The pages describing the different houses are reproduced later but first, here is a newspaper article reporting the sale. 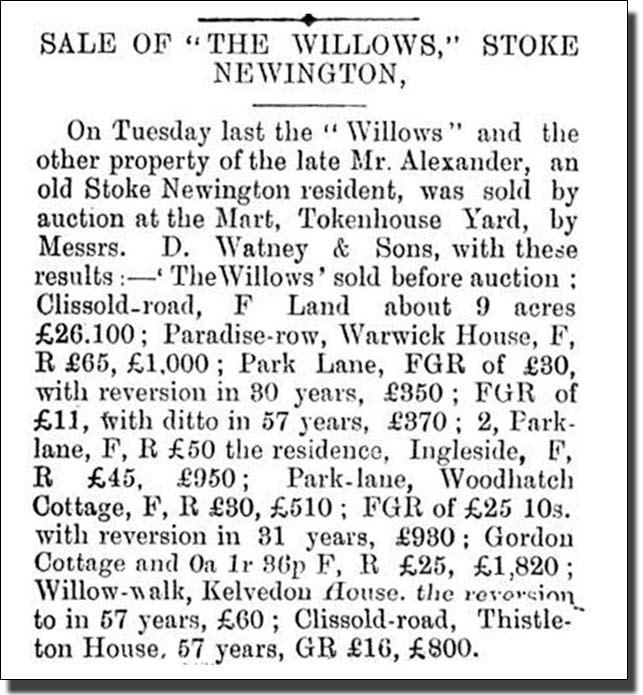 An Extract from an unknown paper in 1891 describing the Willow Estate sale. 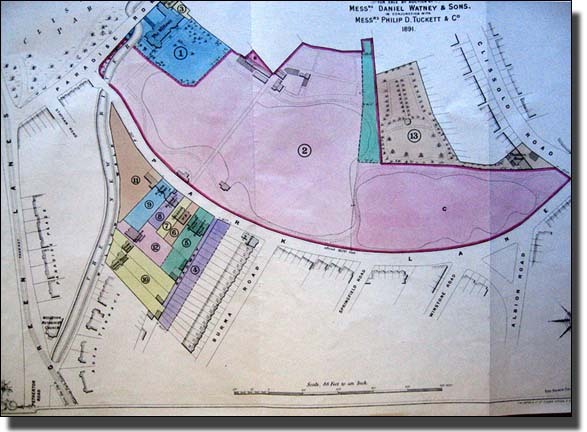 The ten acre estate consisted of about one acre of houses and their gardens and about nine acres of building land. The houses were already let at different annual rents, so anyone buying them would have received the rents from then on, and at the end of the leases the houses would have become their property. Some land was let as Nursery Land and this rent was being sold. Anyone renting the houses was responsible for maintaining the properties and paying any taxes as well as the rent. The following list was the mixture of propreties being sold in a number of separate lots, at the auction. This newspaper report is written in auctioneers’ jargon, full of abbreviations and difficult to understand. Below is a simpified version with the names of the houses in italics and abbreviations written out in full. 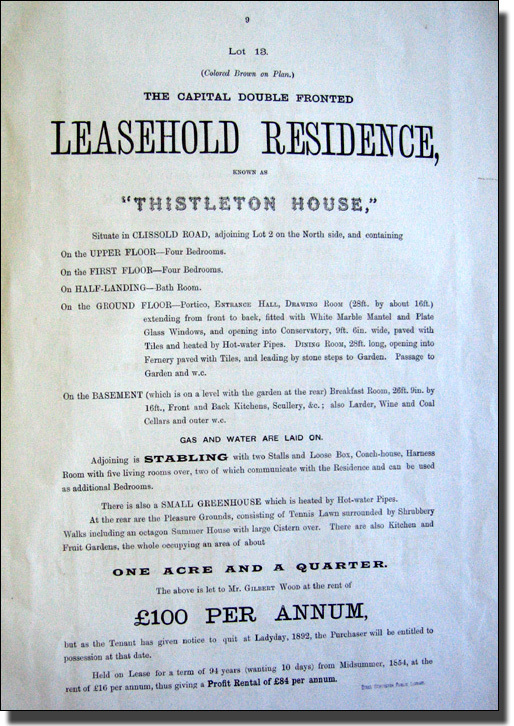 Lot 13: Thistleton House. Clissold-road, 57 years, Ground Rent. £16, sold for £800. Below are longer descriptions drawn from the Sale Document. This document is reproduced in facsimile later for those interested in which parts of each lot seemed most attractive to both investors (who wanted to invest their money in existing bricks and mortar and so have an income from rents for years to come) and developers (who wanted to clear the land, sell the trees and build new houses). Both sorts of people would have been at the sale. The auctioneers knew what would appeal to each type of buyer and printed the attractive parts of each lot in heavy type. There appears to have been a house called The Willows in Paradise Row and when Mr. Alexander bought it in 1848, he pulled down the old house and built the new one in the Victorian Gothic style, which was fashionable at that time. It was this building which was sold in the 1891 Sale and became Kennaway Hall. I am not clear when the house was given that name, or by whom. It was a very large house indeed, with eleven bedrooms, and in 1891 it was in use as a Ladies Home, or Missionary College occupied by the Mildmay Mission. Whether it was built for this purpose, or was originally a private house, is not explained in the brochure. It was sold by private treaty, so it seems likely that the Mildmay mission bought it. 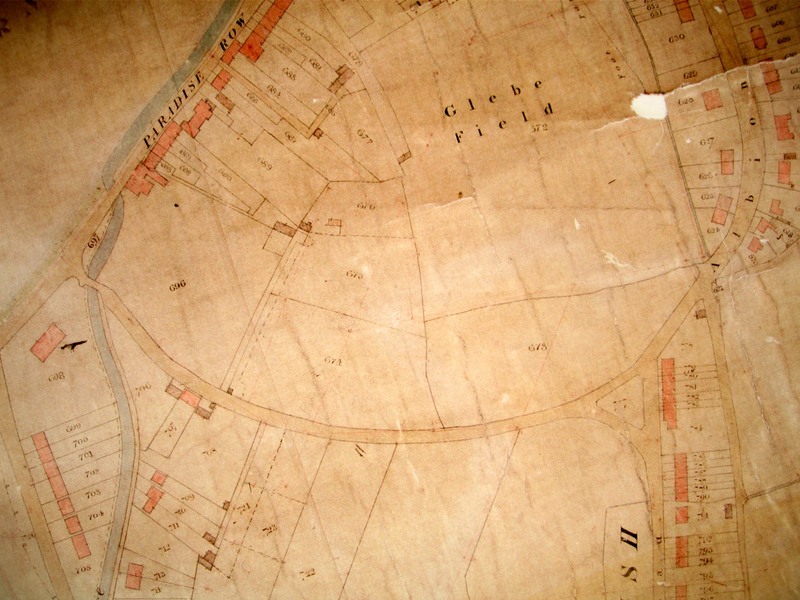 This was the Nine Acres of open land which most attracted the developers. There were some buildings, stables, greenhouses etc. on it, but they would be demolished; the trees felled and sold. This was a freehold house in Paradise Row, next to The Willows. It was a substantial four-storey building let at £63 a year. At the top was a 24 foot bedroom with a flat lead roof. The roof was railed, so in sunny weather it must have been a splendid open-air space overlooking Clissold Park. This house was occupied originally by Mr. Hanbury. This was a piece of land having a frontage of 40 feet to Park Lane by a mean depth of about 350 feet, and occupied as Garden Ground attached to several Houses in Burma Road. On a 99 year lease dated from 25 th. December, 1822, at a rent of £13 p.a. The lease on Lot 4 comes to an end in 30 years and the house become the property of the ground landlord. This is called Reversion. These were two semi-detached houses in Park Lane which were let for 94 years from 1954, at the rent of £11 per annum. There were some stabling and outbuildings at the rear of Kelvedon House and the right of way over the roadway on the east side, the soil of which was included in Lot 4. This was a three-storey house with a Basement. It had a 26 foot frontage in Park Lane and had been let for many years to Mr. Ernst-Champness, a yearly tenant of many years standing, at £50 per annum. This was somewhat similar accommodation to Lot 6. It was let to Mrs. Henry Rawlins until Christmas next at £45 per annum, so the purchaser would have had the right to possession after the sale. (This one might be of interest to someone who wished to move into the area). This was a double-fronted two floor house with a Basement. It had a frontage of 33 feet 6 inches and was let to Mr. Sydney Stevens on a three year agreement from the previous 25 th.March. at £30 p.a. This ground rent was secured on Albion Lodge, which had a large garden behind. It was let on a 99 year lease from 20th day of September, 1823 at the rent of Fifty pounds twelve shillings and per annum. Ground rent £7.10s.0d. (Seven pounds ten shillings). 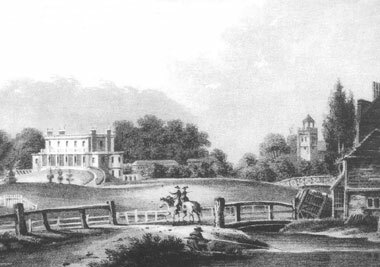 The land was sold in 1810. These leases from 1822 and 1823 take us right back to when Paradise Row was being developed and the prices reflect price levels of that time. The leases were for 99 years from 29 th. September 1923. This confirms the dates of the other lease and probably means that the houses were built by Thomas Cubitt who bought this lot in the 1821 sale. This was a building with about a quarter of an acre of garden in the corner of Park Lane and adjoining Lot 9. It was let at £25 p.a. This house was a valuable freehold residence with a large garden at the rear, situated in Willow Walk, Green Lanes. It would revert in 57 years to the rack rental. It was estimated that it could be rented for £100 a year. Rack rental - a rent stretched to the utmost annual value of the things being rented. Some houses are sold with the land they stand on and are Freehold. Others are LeaseholDecember 23, 2008 3:50 PMent has to be paid to the landlord each quarter for the use of the land. At the end of the lease the house becomes the property of the landlord again. A Note on Peppercorn Rents. When landlords with empty fields want to encourage builders to build on their land, they sometimes let them do so, for a few years, at a peppercorn rent. A single peppercorn is worth nothing and is merely a token payment. This gives the builder time to build and sell his houses. Then, when the houses are built, the landlord will charge the new owner, or tenant, a Ground Rent in real money, for perhaps 99 years. 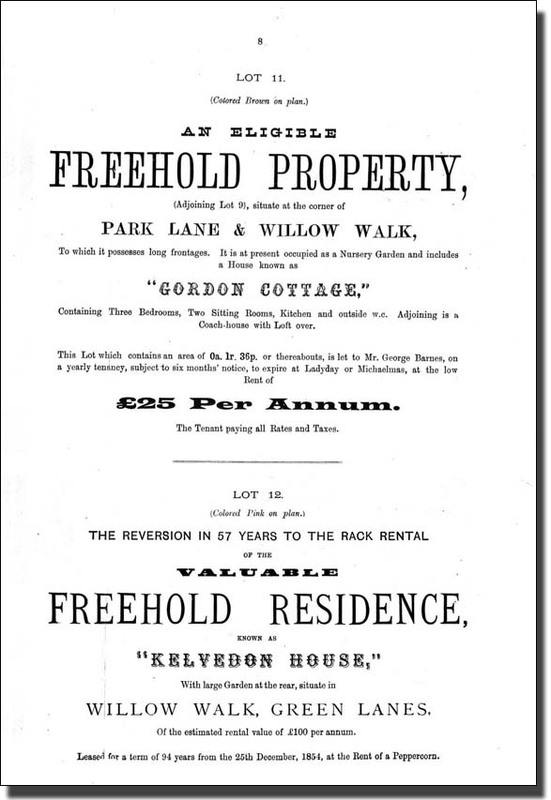 Strangely enough Kelvedon House was leased for a term of 94 years from 25th December, 1854, at a rent of a Peppercorn. This is the action of a king, or a great lord. One hears in history of large estates being granted to favourite courtiers for a silver rose, or a bunch of flowers each year. Here a large house was granted for 94 years for nothing. It may have been a way of providing a home for one of the family, perhaps a daughter. The 1861 Census might provide the name of the person, but identifying Kelvedon House on the census return could be difficult. Perhaps someone else will answer the puzzle. Below are two examples pages form the original sale document. 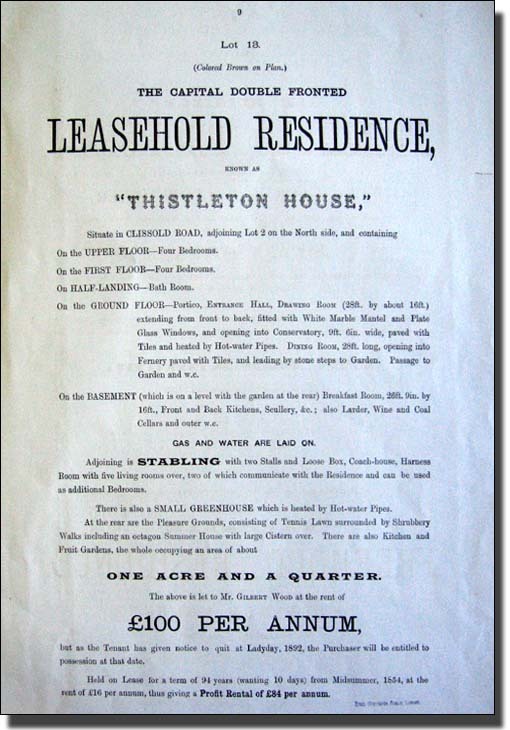 The first is a photograph of tha page for Lot 13 - Thistleton House, the second, of Lots 11 and 12, has been processed to make it easier to read. This has been the description of the Sale Document in 1891. If you want to see facsimile copies of the Sale Document Click here. 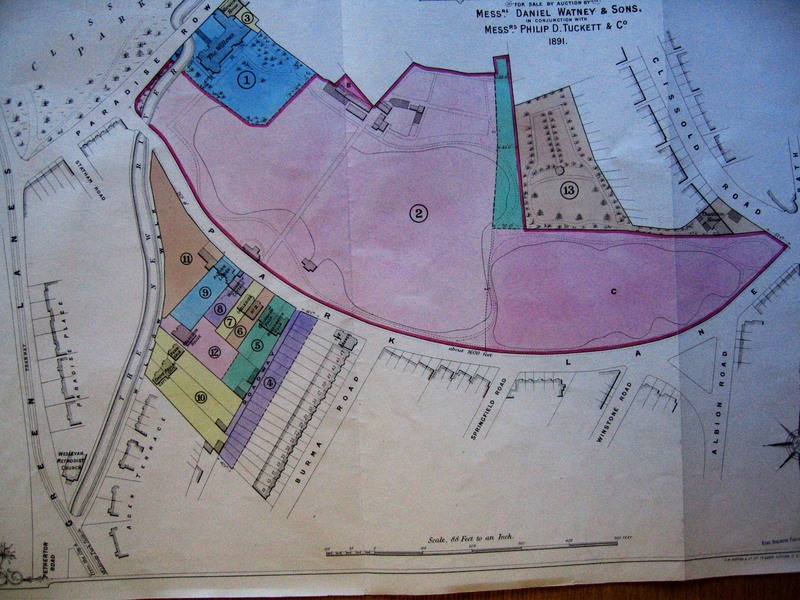 The next section, called The Willows Site, 1891 to 1914, shows how the site was developed over the years.